“I adopted Shane, an 8 month old German Shepherd in August of 2014. Over the years I had previously owned six other German Shepherds, raising three puppies and adopting three others. Based on my experience I thought that training Shane would not be a problem; I was wrong. Aside from being house broken, it was apparent that she had never been trained or socialized. Shane did not even understand basic commands, i.e. sit, stay come, etc.–she basically did her own thing, what she wanted when she wanted. She was difficult to walk on a leash, constantly pulling, and was very aggressive, snarling and snapping at the air, whenever we encountered people or other dogs. After several weeks of trying to train her on my own and seeing no appreciable progress, I decided to use a professional trainer. A friend recommended S.R. Dog Training. Steve came to the house weekly and in just a few short weeks transformed Shane into an obedient dog that now responds to my commands. She is now a pleasure to walk, automatically dropping into a sit position when I stop walking; she does not react to people that we meet and generally ignores other dogs. 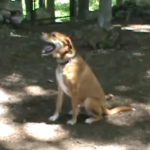 Shane’s owner contacted me for dog training in Mahopac NY in order to help with her leash walking and obedience training. Shane would constantly sniff and drag her owner when on walks. She was very reactive toward strangers and other dogs. Check out her video above to see the leash walking transformation we were able to achieve in just 30mins. 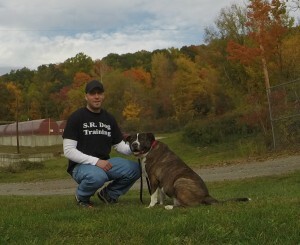 We are in the process of taking Shane through complete obedience training in Mahopac NY. Our goal is to teach her basic obedience commands, gradually introduce/increase the Three D’s of dog training (distance, duration, distractions), and finish with her being fully obedience trained. Shane is a sweet and happy girl, who will be polite and well-behaved within a few short weeks. In-home dog training in Mahopac NY will provide her owner a more relaxed and stress-free lifestyle with Shane. Casper’s owners were really struggling with dog training in Mahopac NY. This 5 year old Lab mix was displaying several behavior issues on a daily basis. This was very frustrating and stressful for his owners. Casper had a tendency to steal food off the table, jump on the furniture, bark at people who walk in front of the home or ring the doorbell, ignore obedience commands, and escape their yard and not return for several hours. Needless to say, this is very frustrating, stressful, and concerning for his family. We started off by adding much needed structure and boundaries to his daily routine. Many of these are outlined in Guidelines for Dog Owners. We completely off leash obedience trained Casper using low level remote collar training to help reinforce obedience commands and reliably get him to “Come” back when he escapes the yard. A well-trained dog makes life less stressful for the owners and creates a happier life with more freedom for the dog. Casper’s owners were serious about training and dedicated to making positive changes in his behavior. A dedicated owner and proper training lead to the terrific transformation Casper made using in home dog training in Mahopac NY. Simple, safe, and effective training principles will help any age, size, or breed dog. I have worked with hundreds of dogs of all breeds, ages, and sizes. 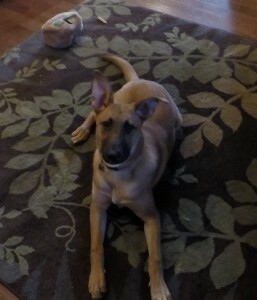 Leia is a 6 month old Belgian Malinois/German Shepherd, who is in the .1% of dogs. She has an insatiable level of energy, with a “go-go-go” mindset. Out of nowhere, she can go from 0 to 100 M.P.H. Leia’s unusually high energy level and constant need to work and be active is due in part to her working dog genetics and young age. She has terrific owners who are young and can keep up with her, as most families would not be able to handle her active mindset. They contacted me for Dog Training in Mahopac NY, because a bored dog with pent up energy can get into A LOT of mischief and destroy items in the home. Reliable obedience commands are important for every dog, but absolutely essential for Leia. With rock-solid obedience, her owners will be able to harness her high energy level and provide much needed mental stimulation. Reliable obedience is what enables her family to put Leia in a “Down” or “Place” command when she needs to calm down and when company first arrives to their home.